The degustation at the Royal Mail Hotel was the most interesting, most delicious, most fun meal I've had all year - and that's saying something. Not only was the food and wine brilliant (much, much more about that below), but the setting and the service were both exceptional. Road trippin' with Miss B and Miss T to a wedding in Robe, South Australia, we'd cunningly engineered our weekend so that we'd spend the Friday night at the Royal Mail. 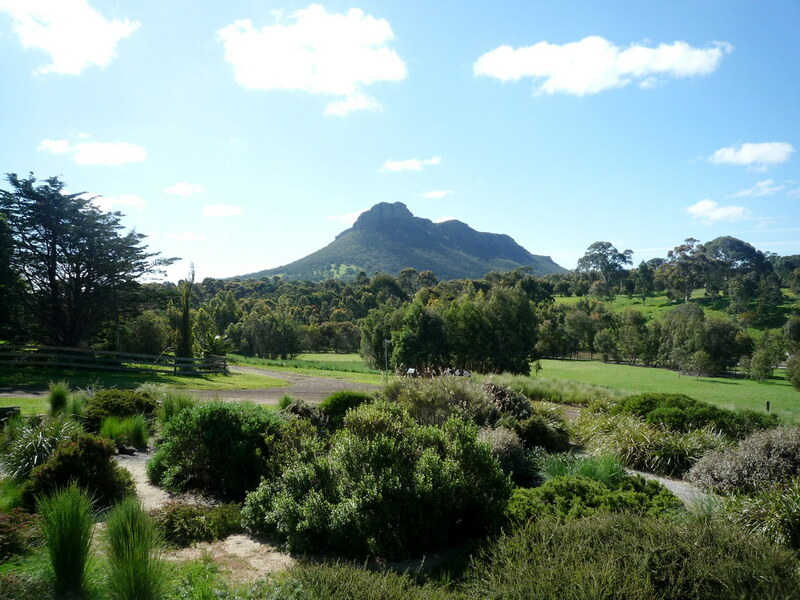 Our simple, stylish room had a lovely view of Mount Sturgeon and we all enjoyed our pre-prandial stroll through the bush skirting the grounds of the Hotel. Upon arrival at the restaurant we were seated at a table for three offering great views of the mountain and the kitchen. We chose the Menu Omnivore ($150 per head) and Miss B and I ordered the matching wines ("Village" wines, $115 per head). Miss T has a lower alcohol threshold, so she asked the sommelier to design a mini matching wine menu for her - one sparkling, one white, one red and one dessert, to be spread out over the eleven courses. He happily did so. A word on the service. Restaurant manager Clinton, assistant restaurant manager Ainslie, sommelier Jeremy and the rest of their team were amazing. They were professional, friendly, knowledgeable and practically telepathic when it came to knowing what their guests wanted. From our vantage point, we saw them co-ordinate the evening with smooth aplomb. As finishing touches were being made to our dishes in the kitchen, three staff members would materialise, collect the dishes and then peel off - like planes in formation - so that our three dishes were placed before us in unison. All this and more was done without a hint of spectacle or haughtiness. It was a real pleasure to watch them work! 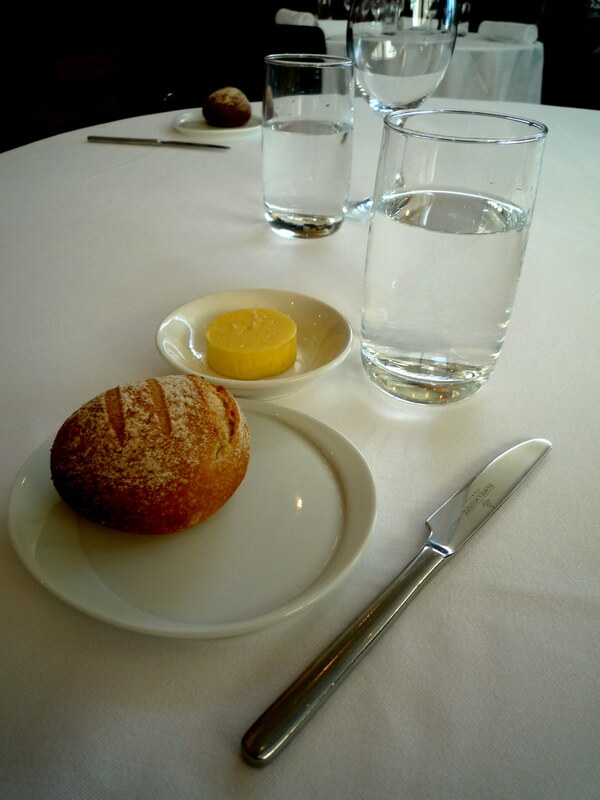 Okay, so, to begin with: the housemade bread was accompanied by some exquisite smoked vine leaf butter. 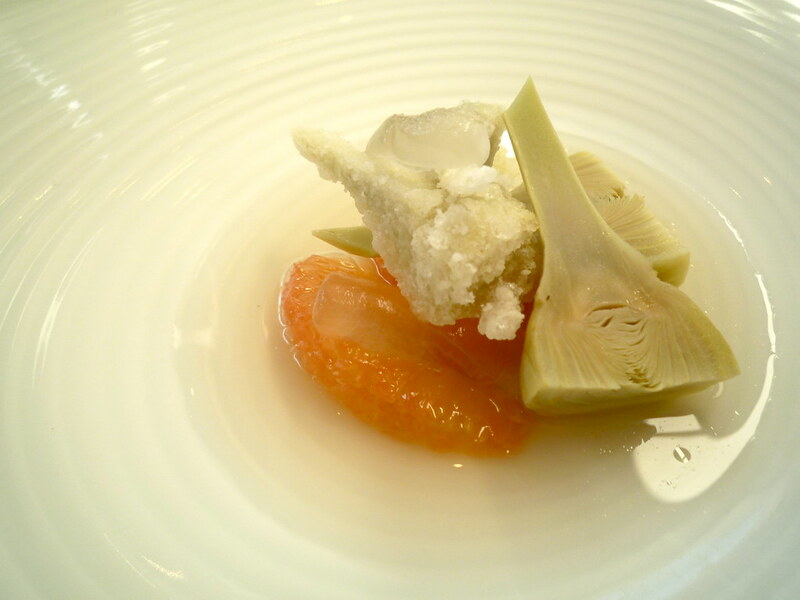 The first course was artichoke (some of which was encrusted with potato starch crumbs) served with aloe vera, compressed sugar syrupy grapefruit and a "marine essence" consisting of a mussels-based broth flavoured with lemongrass and galangal. 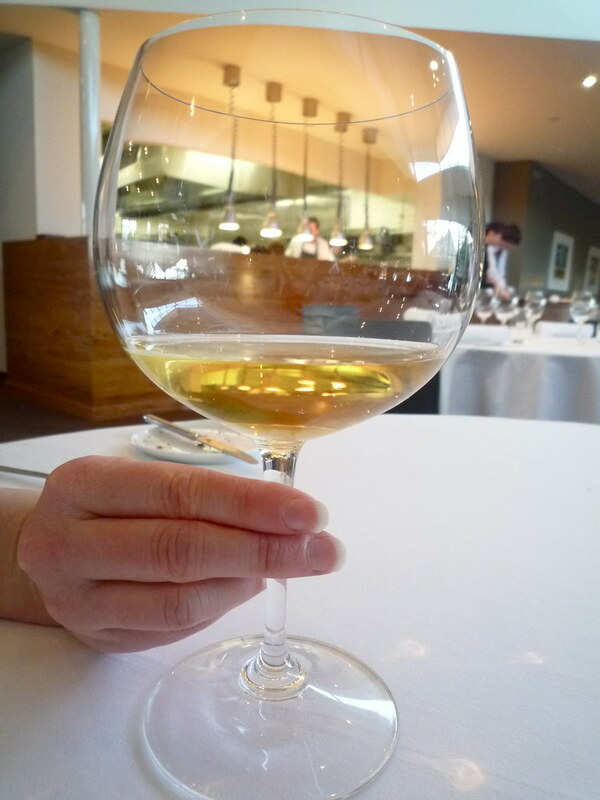 Very delicate flavours - the perfect way to start the meal. 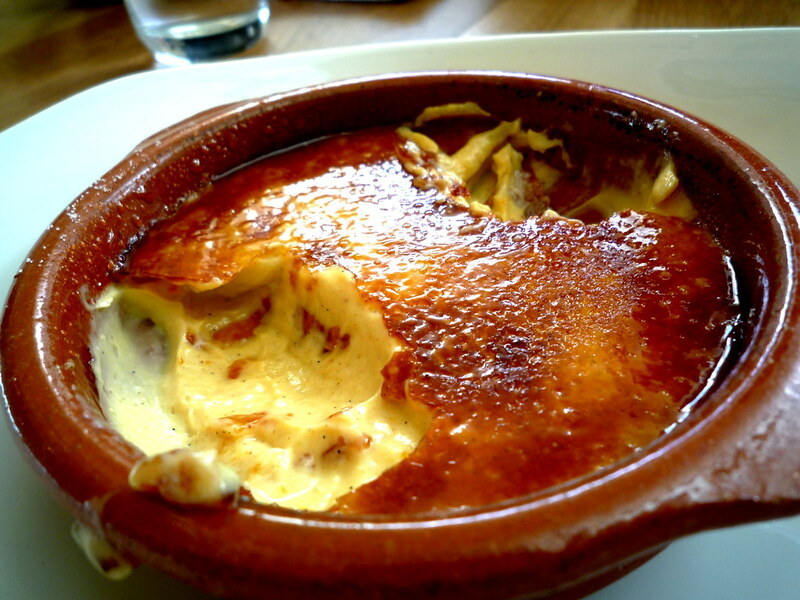 It was served with a light NV Philipponnat Reserve Rosé (Champagne). 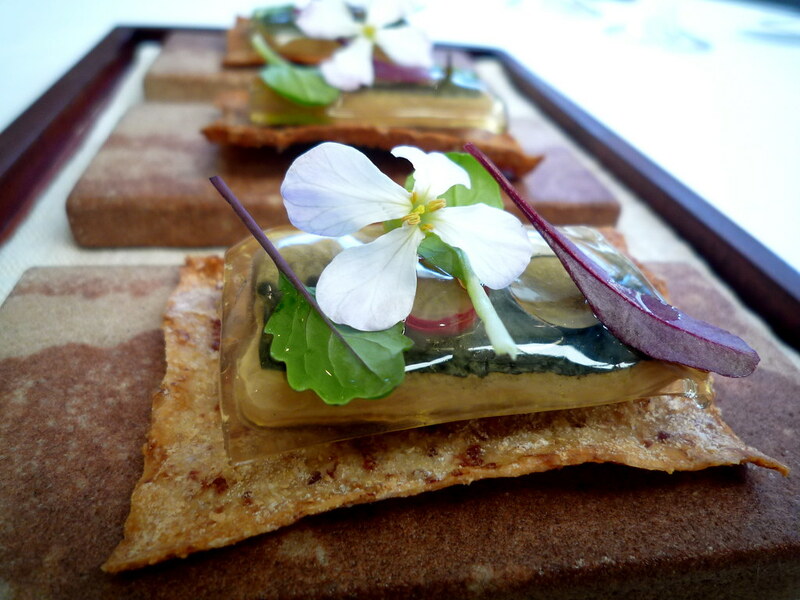 On the heels of the artichoke came the "sardines on toast": marinated sardine fillets topped with teeny tiny radish flowers, slices of radish and translucent panes of tuna broth jelly. So cute! The sardines went beautifully with a small glass of NV Sanchez Romate Palo Cortado (from Jerez) sherry. 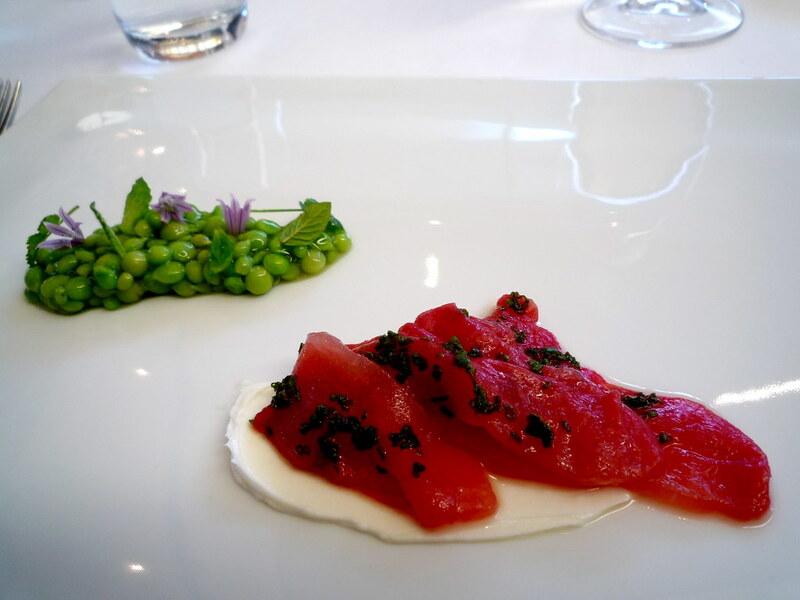 The next dish was described on the menu as "Sugar snap pea, soured milk, spearmint, sashimi". Our jaws dropped as the plates were placed before us. Wow. All three of us were impressed with the presentation of the dish. The sugar snap peas were flawlessly arranged (bound together by some sort of ginger-based translucent goo - if anyone knows what it is, please tell me* - that made it look like some sort of spawned alien pod, but in a good way!) and topped with minuscule chive flowers and spearmint and baby coriander leaves. They were the best-tasting peas I've had in years. When Ainslie checked back with us to see what we'd made of it, Miss B ventured a correct guess: watermelon! It had been dehydrated and compressed, so that it draped over the scrape of soured milk just like a piece of tuna, and it was sprinkled with flakes of what I believe was bonito/spring onion. Crazy stuff! Oh, and I should point out at this stage that this "crazy stuff" also tasted amazing. This was intelligent cuisine, but it wasn't intellectual to the point of being clinical: it was still all about the ingredients. 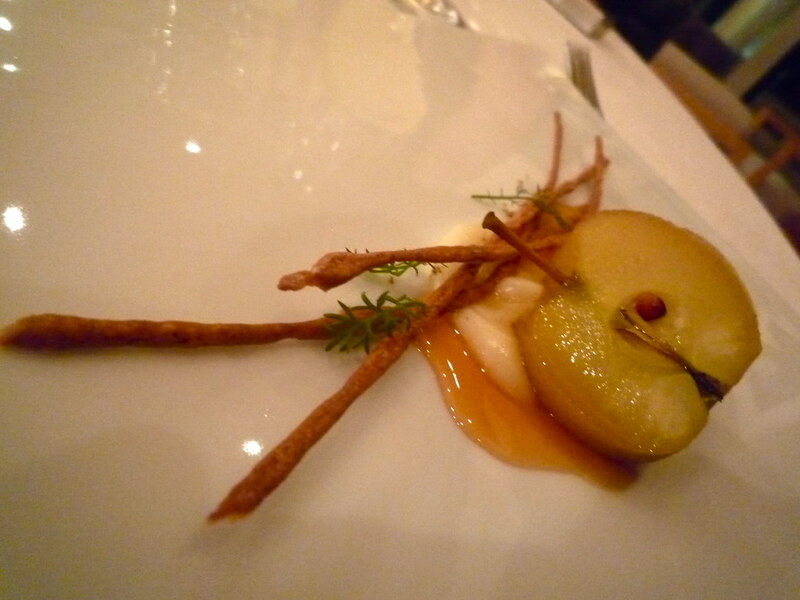 In my opinion, the fancy molecular techniques (and stunning visuals, and playful textures) bring used at the RMH didn't distance us from the ingredients, but rather served to highlight and enhance their fantastic quality. Most of them come from the restaurant's three gigantic kitchen gardens, which produce more than 150 varieties of organic and heirloom vegetables, leaves and herbs. Accompanying the sugar snap peas and the "sashimi" was a 2009 Grosset Semillon/Sav Blanc (my two least favourite wine varieties, sorry!) from the Clare. Moving along to dish number 4: behold the stunning stunning presentation of the course of egg yolk, toasted rye, asparagus and yeast. Those little leaves on either side of the glorious yolk are miners lettuce. Completely buried under the toasted goodness were delicate little asparagus spears and a scrape of what at first glance looked like avocado but was a cream of asparagus and horseradish. It was toe-curlingly tasty. The strong yeasty, golden eggy flavours were supported by a big old 1997 Best's Chardonnay (Great Western Vic). 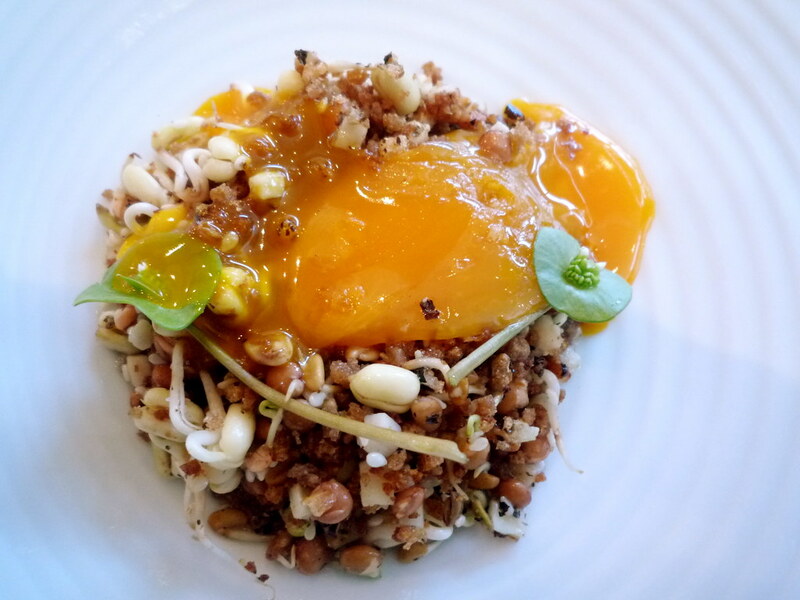 "Mung bean tartare?" quipped a friend of mine upon seeing the photo. Ha! The prawn and pork was a sort of surf n barnyard turf, served with the 2003 Crawford River Riesling (Henty, Vic). The pork was from the piggy tail, cooked sous vide for about ten hours and then crisped on just one side to provide a fabulous textural (and flavour) contrast. 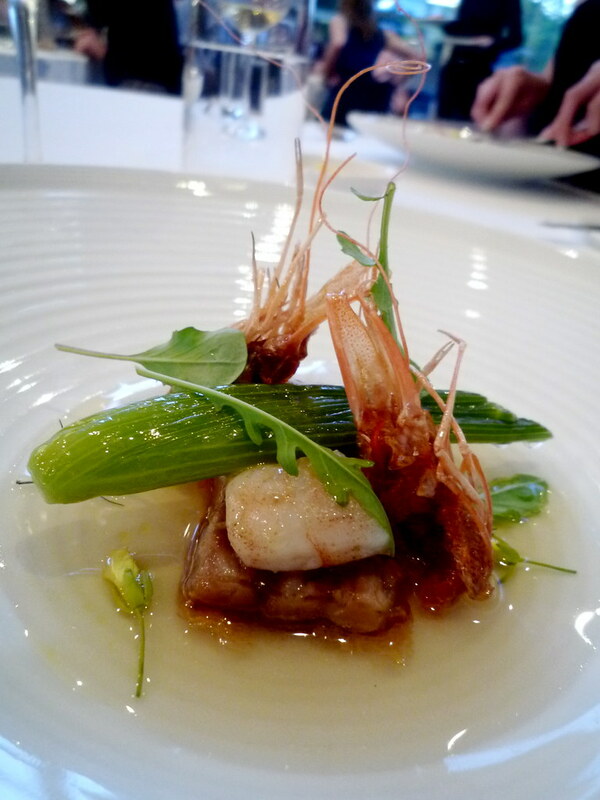 The prawn contribution to the dish was the broth, the nuggets of flesh and the two heads perched on each side of the dish like a family crest, with crispy curlicues reaching for the sky. 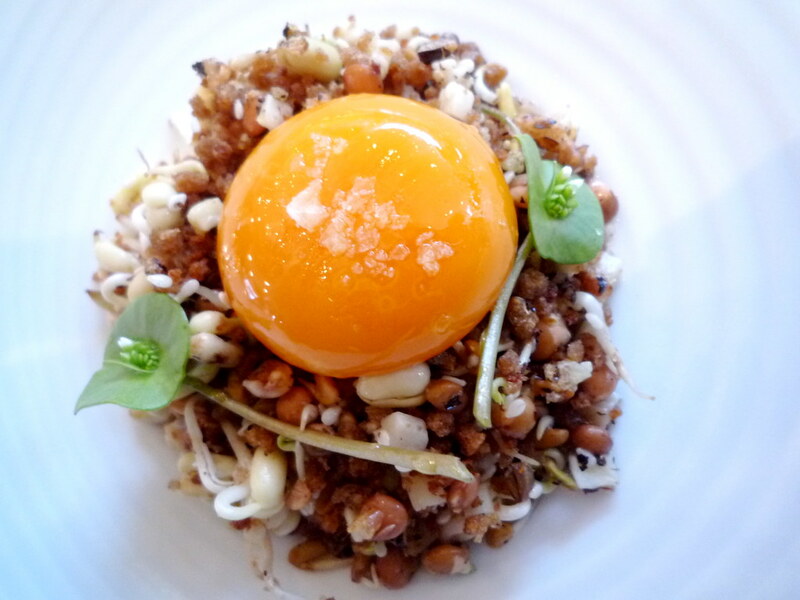 Add to that fennel, wild and cultivated rocket and tiny rocket flowers, and you have one hell of a dish. The Crawford River Riesling remained our chosen wine for the next course too. The yellowfin tuna had been cooked sous vide at 60 degrees for only ten mintues, so most of it was still wonderfully raw. Reminds me of my favourite way to cook tuna (ie sear big thick tuna steaks on the BBQ for mere seconds so that they're still sashimi-raw on the inside). 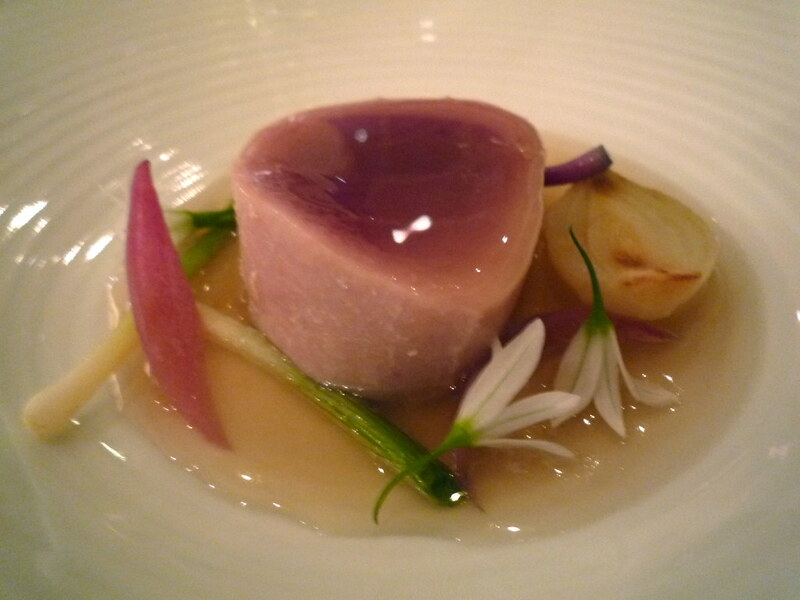 It was accompanied by super-viscous broth, garlic, nori and onion (tiny wild onion flowers). 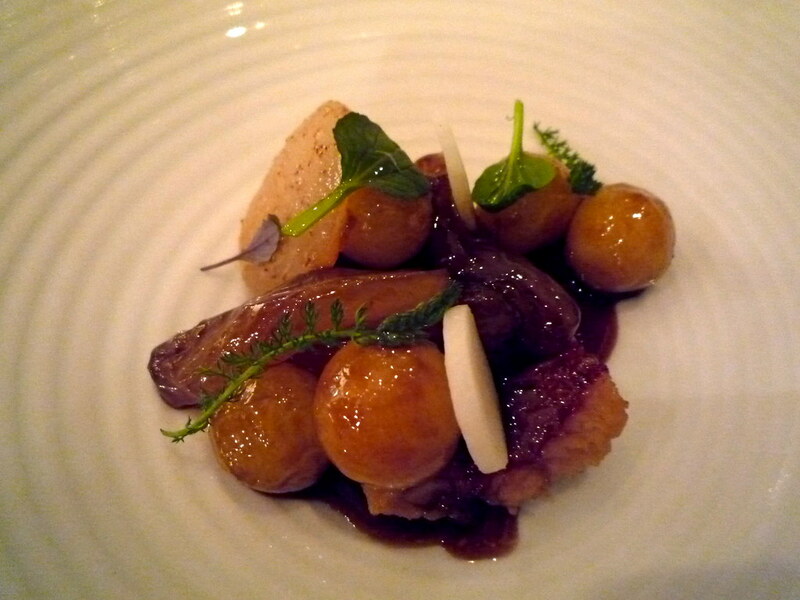 Next came a course of eel with beef tendon, discs of kohl rabi and potato spheres. As with the earlier pork, the beef tendon had been cooked sous vide for 10 hours. Its texture was sticky and mouth-filling and unique and oh-my-god-words-fail-me. Matched with the 2006 Acústic Cellar Grenache/Carignan (Montsant, Spain). 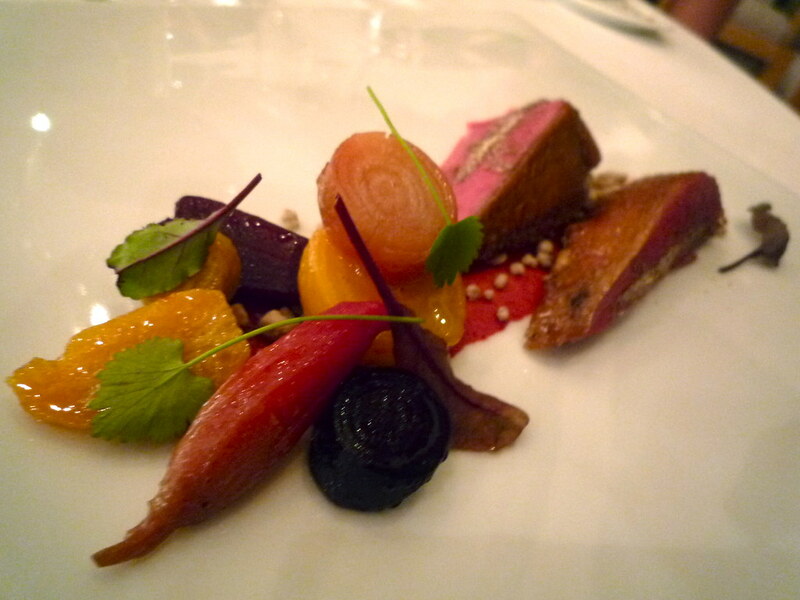 The pigeon was another dish that just slayed me. Crispy roasted breast of pigeon on a liberal sprinkling of white chocolate crumbs (made with kaolin, which gave the crumbs a fascinating clay-like texture) and a side serve of the most perfect roasted baby beetroot (three varieties: bulls blood, golden and rare heirloom Chioggia). What really tipped me over the edge were the little runways of fine powder running along the pink flesh of the pigeon: the powder turned out to be a mixture of rose, lime and salt. It was like nothing I'd ever tasted before. Impossible to choose a favourite dish of the night, but DAYUM this'd be close! It was served with the 2005 Best's Pinot Meunier (Great Western Vic) - I haven't drunk much pinot meunier on its own rather than in a sparkling, but it was delicious. 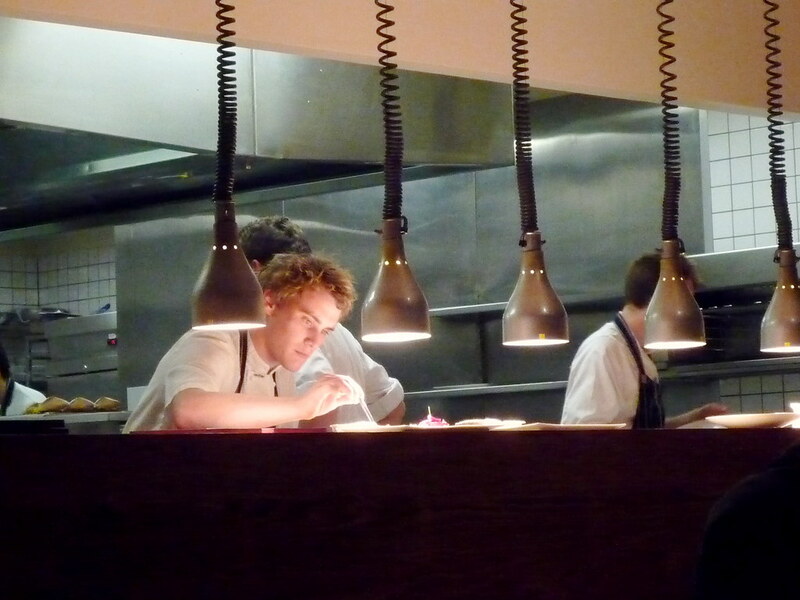 Why yes, that nice-looking young man in the kitchen IS using fancy tweezers to arrange the finishing touches on a dish. The first of the three desserts was apple (a small golden delicious, cooked sous vide for a couple of hours) served with chamomile, caramel left over from the sous vide cooking process, and insanely rich triple cream cheese stock and a couple of skinny walnut flour grissini. Again, I find I'm running out of superlatives. Look - just go there, okay? The dessert wine from Alicante (NV Primitive Quiles Moscatel) was nectar from the gods. 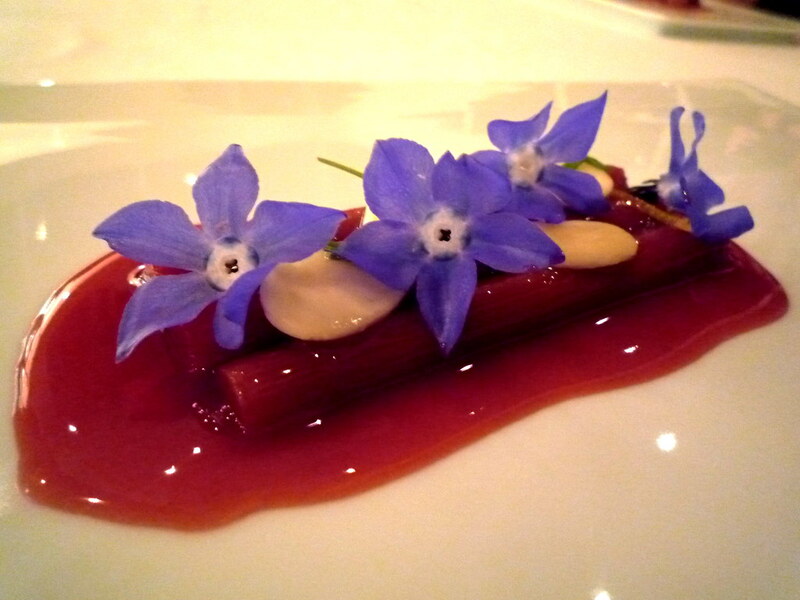 The second dessert was rhubarb, served with almond, citrus and a licorice gel. My dislike for licorice was tempered by my delight at the tiny edible borage flowers. No wine was served with this course, as it was meant to be a palate-cleanser (which my wearying palate was grateful for). 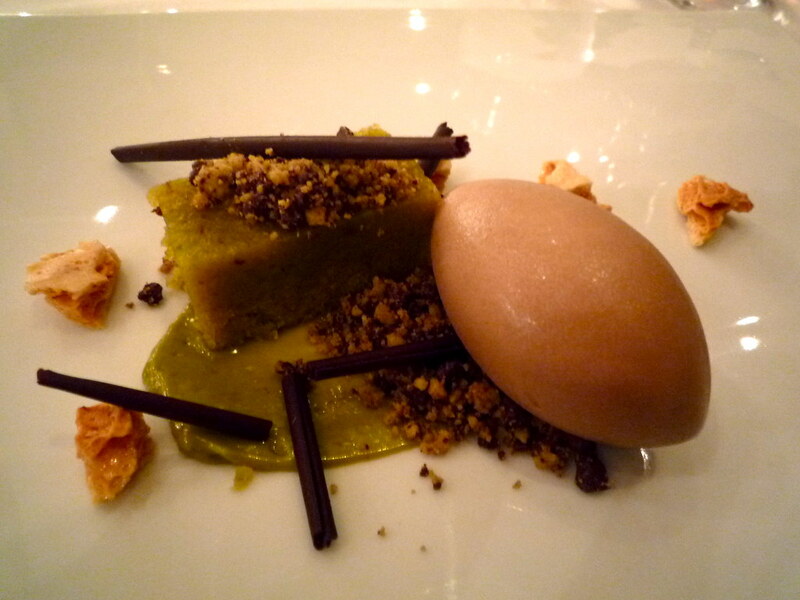 The final dish was the pistachio (paste and spongy cake), with hazelnut gelato, pieces of honeycomb, crumbs of chocolate and pistachio and little curls of chocolate. On the wine front we'd come full circle back to Sanchez Romate sherry (only this time it was a cream sherry). Miss T, my favourite Melbourne Gastronome hand model, displaying the bill and the packets of nutty chocs we were given to take with us. 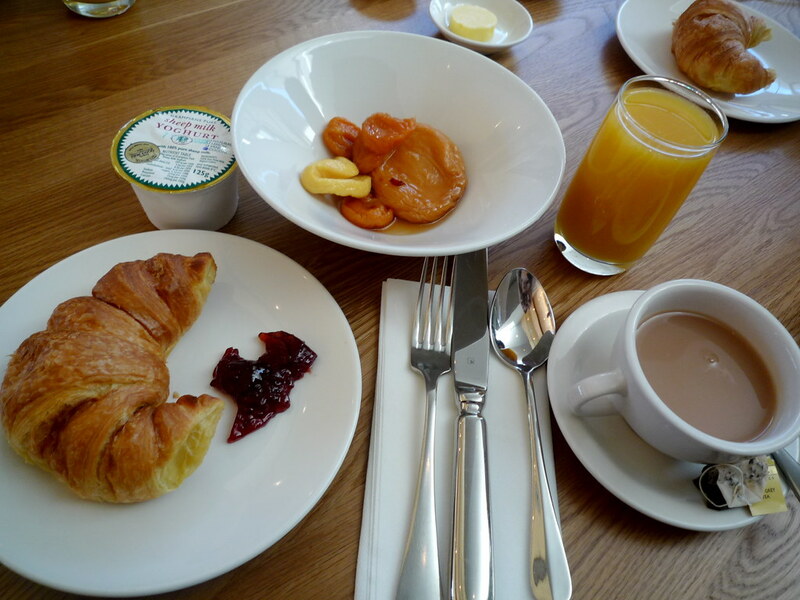 On the Saturday morning (included as part of our hotel room stay) we went back to the restaurant, to our same table as the night before, for a continental breakfast. I particularly liked the local Grampians sheep milk yoghurt - mine was coconut flavoured. On the Sunday, having attended a lovely wedding the afternoon before, I was being driven back to Melbourne by my friends C and CC. 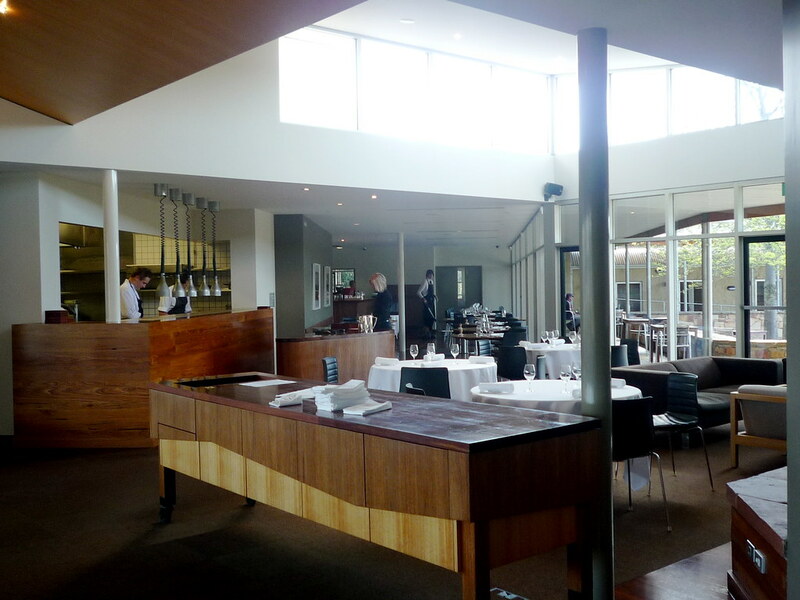 I was waxing rhapsodic about the amaaaazing meal I'd had with the girls on the Friday at the Royal Mail Hotel. C exchanged glances with his wife. "Well... we will be passing through Dunkeld at about lunchtime, and we're keen to check it out... what would you say to lunch at the Royal Mail Bistro?" 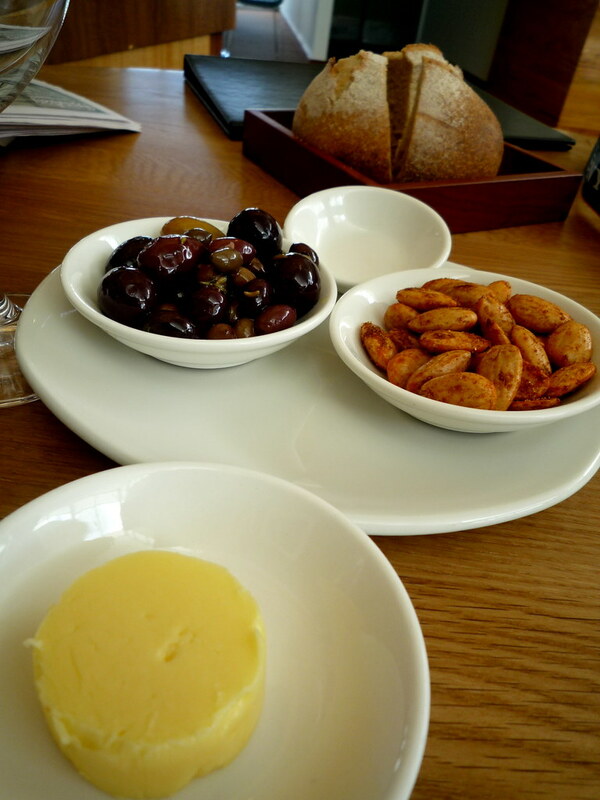 We were brought a serve of marinated olives and spiced almonds. 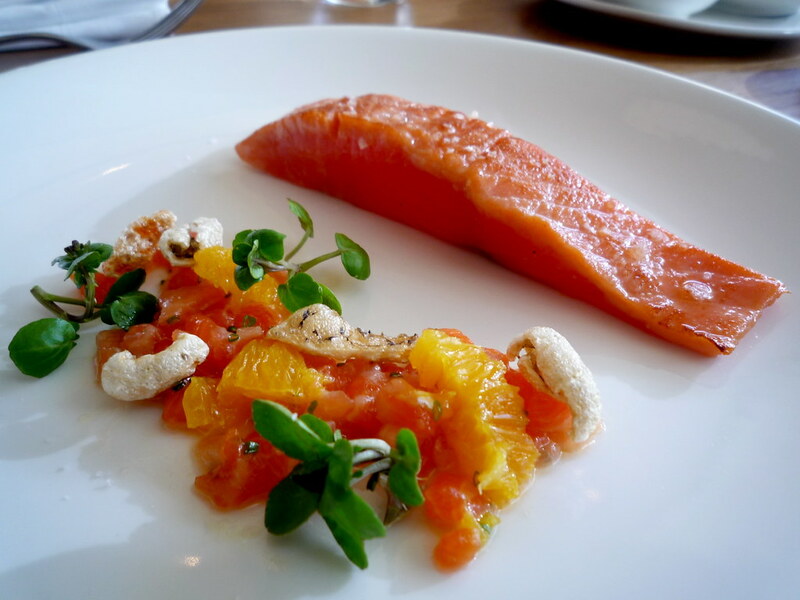 CC ordered the gorgeous-looking cured ocean trout with orange, saffron and trout 'crackling' ($18). 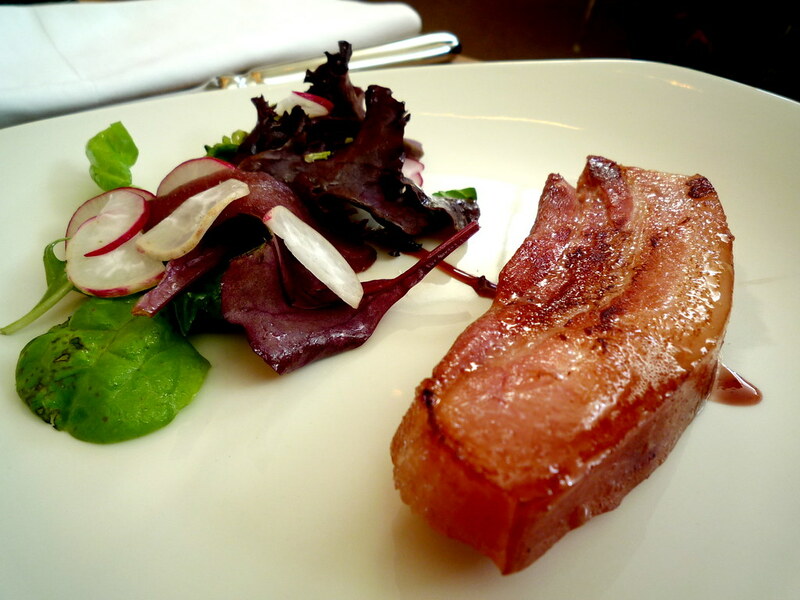 C enjoyed the house smoked pork belly, which came with with back radish, pear and spiced red wine ($19). 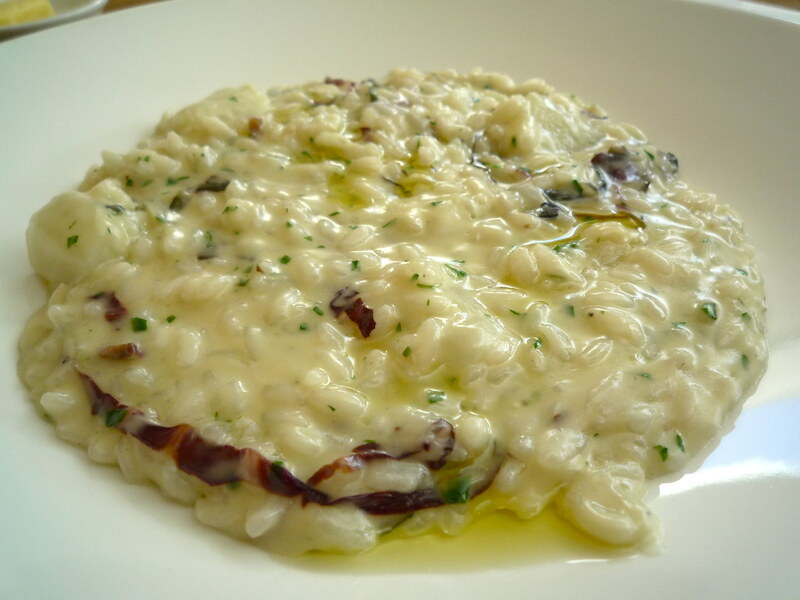 I had the risotto of fennel, radicchio and gorgonzola ($16). Gorgeously bitter and sweet and rich. 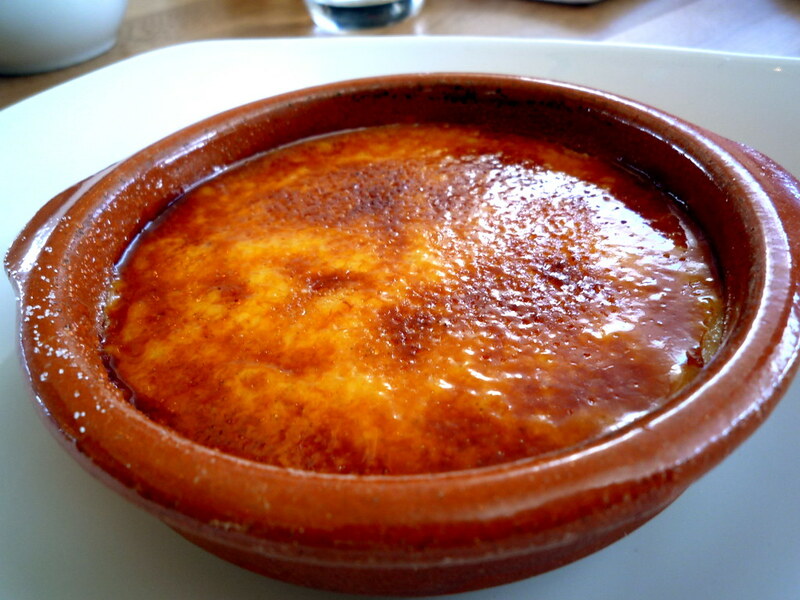 To finish, the three of us shared the Crema Catalan ($12), with neither C nor CC had tasted before. Also excellent. Anyone fancy coming on a Dunkeld road trip with me this summer? I'm serious! Watermelon Carpaccio hey.. wait till you see my Mugaritz write up. Did you use your usual camera? the photos are very speccy. Bloggers Banquet at RMH? Essjay: well it was a little thick to be carpaccio, but I get your gist. Thanks, I did indeed use my usual little pocket camera. I think the skylight really helped with the quality of the earlier photos. Oh, and I would be IN LIKE FLYNN if there was a Bloggers Banquet at RMH! Next time I visit I'm dying to see the kitchen gardens. Oooh..the memories. What a fabulous post. Dan and I are in for a trip to Dunkeld for sure! Nice photos Claire! I went in the middle of winter so it was dark for the whole meal = crappy photos. Dang. Count me in for Bloggers Banquet. Beautiful pictures, absolutely gorgeous. I went a year ago and was the highlight of my eating year, think another trip is in order. Wow... how good does all that look. I've heard that Royal Mail was great, but now I am sure I must go for a visit!! All l can say is Yum! We drive past all the time when we visit rello's and now we really must drop in for lunch/dinner - you've just sealed the deal! Great photos. Johanna: there's a separate menu vegetarian for $110 (see their website). I just love that in the description of the sugar snap pea dish on that menu, they put the word sashimi in italics (to reassure the vegetarians). Stunning isn't it, Mellie and Kate? I see from your posts that you loved it just as much as I did. 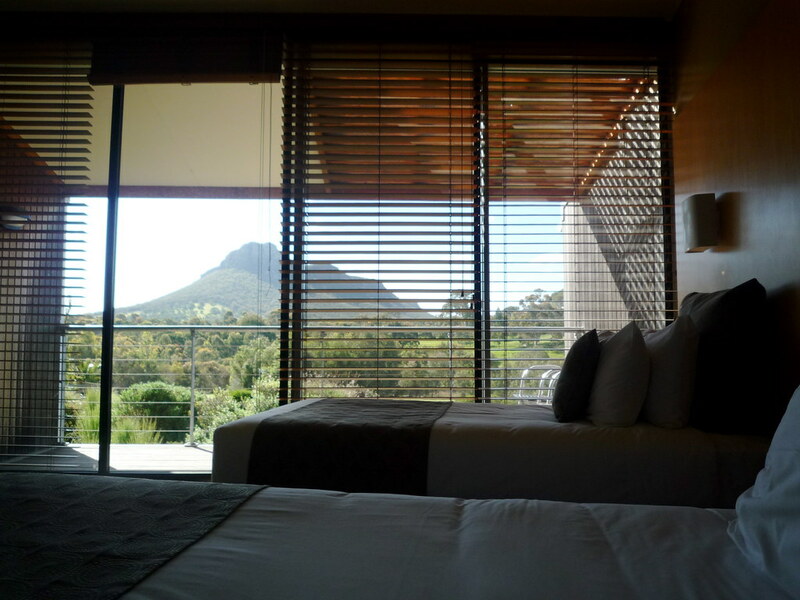 Maybe late January we could try to organise a night away with a group of bloggers at Dunkeld??? imasugarjunkie: glad to have helped persuage you! Hey Bambini: thanks, glad you liked the photos! great write up, a joy to read over lunch! - I haven't been but now really, really want to go. Even just for those almonds! Could that pea substance could be agar..or gelatine? The style of the food is similar to the Merrijig Inn..I went there recently, it was amazing - however we didnt do degustation and I think this would be the only way to do Royal Mail. Great pictures too, is this still the Ixus? 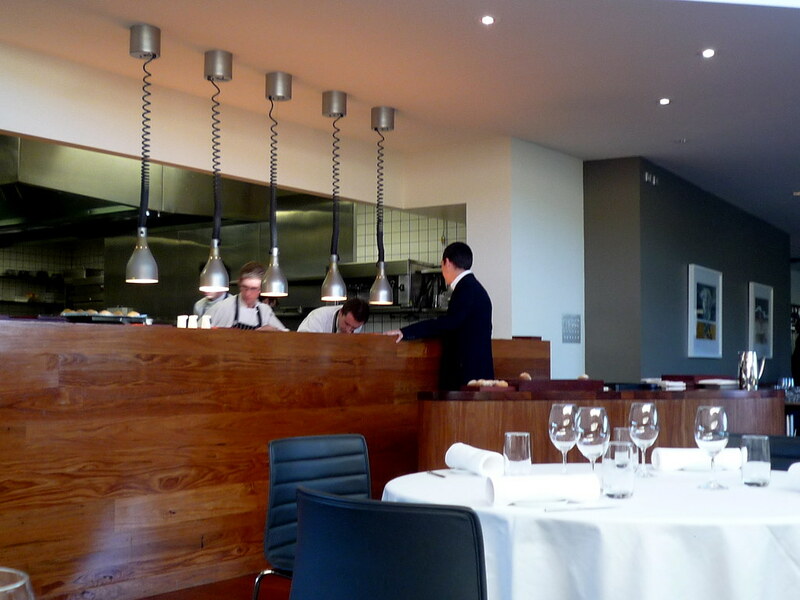 You should totally go - if you like smart, interesting food it's a must-visit. I don't think the pea goo was agar or gelatin... I asked Clinton about it at the end of the night and he said something like "zuzu" (??? ), but I've been unable to track down what it was. Wow - it looks amazing. 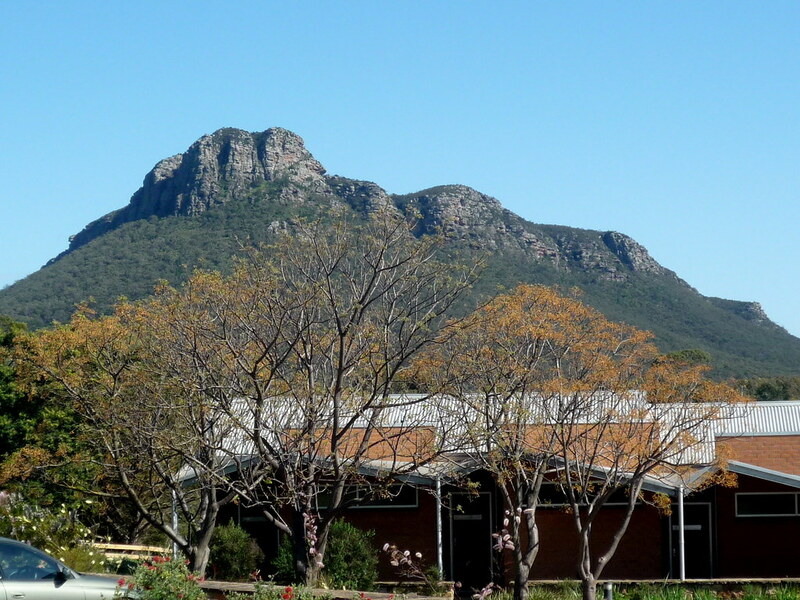 I need to save and plan a trip to Dunkeld. I'm guessing I was there at around the same time and I'd rate it the best I've eaten this year too. The first two dishes were different and a coule of the others were slightly varied. 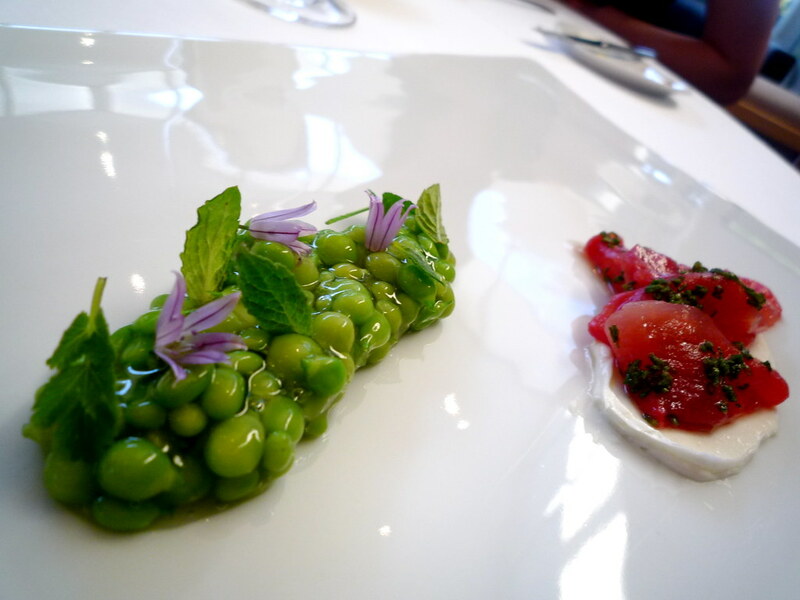 The peas and "sashimi" was one of the highlights for me along with the eel dish. I had no idea that it was watermelon. I found it interesting that the pigeon was the reddest the meat got. loved the Pinot Meunier with the pigeon too. There are so many other places to try, but I'd love to go back. Will have to manufacture some flimsy excuse to get over there again! You had me at 'watermelon sashimi'! 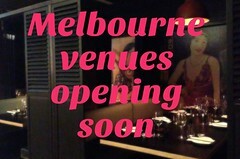 A sign that the vego menu could be equally spectacular. The photos look brilliant, Claire! S-J: do! As you see, I cannot recommend it highly enough. Claire - we thought about it recently, but couldn't get organised to book 6 weeks in advance or whatever it took to get a weekend table. Have to start plotting for next year. wow! amazing looking food, great photos too, claire! I'm looking forward to getting down that way one day next year. Let me know if there happens to be any interest for the bloggers trip, somehow after 4 years of blogging I still haven't met any of you crazy kids! I just watched Anthony Bourdain: No Reservations do a piece on the RMH and thought that would be a great idea for next year. Now your post - if the planets don't align, I'll kick them into bloody place, got that Jupiter. Definitely going. Did you see that episode? 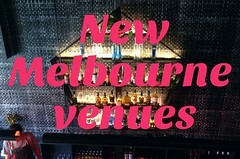 Reckon Bourdain fell head-over-heels in love with Melbourne this time around. Claire, what a wonderful review! I have only just got around to reading it (having had the benefit of the effusive praise in the immediate aftermath of the visit). I am trying to bring myself to claim half of one percent of the credit for your amazing meal with the divine Misses B and T, but I can't! Those dishes are extraordinary, and your photos are just exquisite - I love the way they pick up the sheen on the more 'gooey' - as you say - dishes. Sounds good, Neil! Haven't watched that Bourdain episode, will have to track it down. haven't had much twitter time recently, so I hope I haven't missed the invite for the bloggy xmas drinks? Looks unreally Claire-bear... top effort at CB again the other night! I also just noticed you'd never yet reviewed Cicciolina (which is one of my favourite places). We'll have to head there sometime... I am happy to accompany!